You are going along your work day and just as you are about to submit what you've finished working on the network goes down. You let out a sigh and go to see what the problem might be. The door to the server room opens, and your eyes widen. You are met with a massive mess of tangled cables, and can't make heads or tails of what cable goes to what part of the system. Now what could have been an easy fix now requires your in-house IT to spend their day trying just to untangle the mess. If you don't have your own IT, then you have to call another company for IT to support hoping they can respond in a timely fashion. The worst part is this could have been avoided with Structured Cabling. Problems caused by things like the example above with messy wires and cables will no longer be an issue. Not only will your cables be managed but also organized properly, as well as potentially replacing your multiple wire system with a single structured cable system. Eliminating the complexity of having multiple wiring frameworks, making it easier to identify problems and resolve them. With structured cabling, you will gain several new benefits that allow you more flexibility with your business. Moving things in your office around? Now instead of the headache of dealing with wires, you can just plug in anywhere and continue work. Need to relocate your office to a new location? 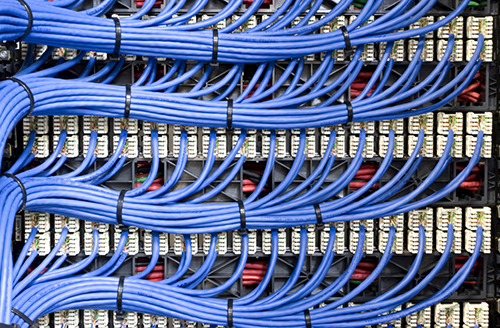 Now with structured cabling, you only have to dismantle one infrastructure to move. Probably the benefits everyone is interested in is how it can help save your business money. One of the key ways it can save you money is that it reduces the need for things to be updated, power costs, as well as lowering your maintenance costs. The consolidation of your system made by structured cabling additionally allows you to minimize the size of the staff you would have had monitoring your old system. Now you can recognize how dealing with that mess of cables in your office sooner rather than later can benefit your business. Don't wait for your current cabling to be a problem call ATEL Communications and get everything Structured Cabling can offer.